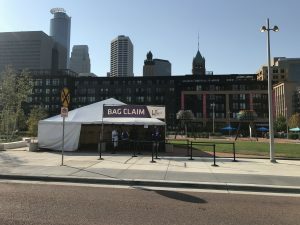 US Bank Stadium adheres to the NFL’s Clear Bag Policy. Walker’s Lockers is present at every game to make it easy for fans to securely check their items and enjoy the game worry-free. Walker’s Lockers is the ONLY OFFICIAL AND APPROVED Bag Check Service for the Minnesota Vikings. We carry Liability and Bailee’s insurance to protect your property while it is in our possession. 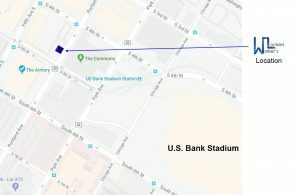 You will find our tent located 2 blocks north of the stadium on Portland Avenue between 4th and 5th Streets (across from The Commons). Be sure to look for the “Bag Claim” tent and Walker’s Lockers logo, you can’t miss us. The times listed below represent the scheduled start and end times of the event. Our service opens 2.5 hours prior to the game’s start time and closes 1 hour after the game ends.